With season five of The Walking Dead heating up and Halloween fast-approaching, zombie fever continues to surge ahead with no indications of slowing down. A few years ago, Esquire magazine did a piece on the popularity of the undead discussing how they have taken over seemingly the entire entertainment horror world from TV to video games to movies and Halloween. Even the stodgy Wall Street Journal chimed in with a piece on zombie fever, now a billion dollar business. Zombies continue to hold first place among all the usual common haunted frights leaving vampires, witches, warlocks and other ghouls to rest for dead. Character zombies come in the top 10 for most popular costumes this year, according to the Party City retailer while Guide Live of Dallas lists zombies as the number 2 most popular costume. Any way you slice it, you can be sure to see a lot of zombie trick-or-treaters this year. So if you are entertaining this Friday, October 31, you can now get your own Zombie Novelty Signs to include in your other haunting Halloween décor. Using legit OSHA safety signs and symbols, this Zombie Safety Warning Sign lets guests or “survivors” know where a safe place to hang out is now that the zombie apocalypse is underway. 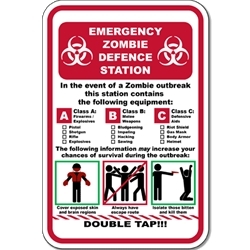 Similar in dimensions to parking signs, these zombie novelty signs can be posted on a door or on a metal post. They are 12-inches by 18-inches so they are big enough to easily be spotted by those seeking refuge from zombie attack. Comprised of sturdy aluminum materials, these Zombie Novelty Road Signs are made to weather all storms, including natural (and unnatural) disasters. These Zombie Novelty Road Signs can also be used as fun décor for hosting weekly The Walking Dead TV viewings at your house or for making your neighbors think you are a serious “prepper” getting ready for the next zombie apocalypse.